This is a page of photos that were sent to us by our customers and a few that we shot of our animals as well. WARNING THAT SOME OF THESE IMAGES ARE GRAPHIC PHOTOS OF WOUNDS. I will attempt to put the more graphic photos toward the bottom (out of sight unless you intentionally scroll down). 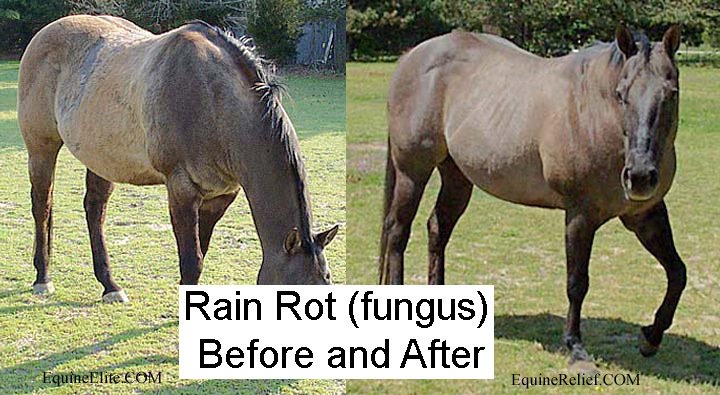 This is what is commonly known as "Rain Rot". It's a body fungus. We've found that it's easy to eliminate with one wash in the Body Wash to sanitize everything out of the skin and hair coat (to prevent any reinfestation).. and then one good spray with the Equine Relief Antimicrobial Spray. That's it. The Wash and Spray penetrate UNDER the epidermis to the SOURCE of the fungus. Treat it one time. (twice with the spray if it makes you feel more confident) .. and then leave it alone. Allow it to heal. Evidence (new hair growth) of healing is usually seen within 24 to 36 hours. This before/after was sent to us by a happy customer. This is Barney. This little terrier's owner said she'd been having a hard time clearing up his neck. In addition to his neck problems, he also had a wound with hair loss on the back of his lower neck. His owner used our Antimicrobial Spray and Wound Relief lotion samples that we had at our booth at the dog show. I shot the "After" photo when we saw them again about three weeks later at a different dog show. This is the healing progress on a deep wound on a horse's leg. (Note there was never any sign of infection) Treatment with our products is painless. 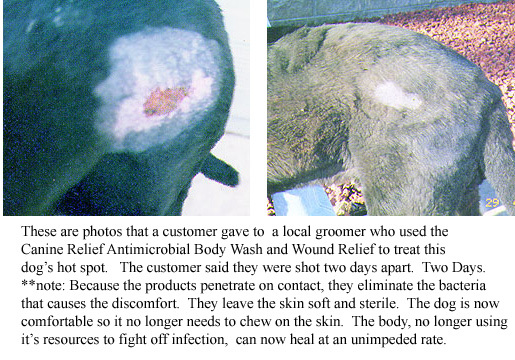 These photos were provided to us by a customer of a local groomer who used the Canine Relief Antimicrobial Body Wash and Wound Relief. The dog owner said these were shot two days apart. She said that she "couldn't believe her eyes!". This is my mare Playmate. She was attacked by a 90+ lb German Shepherd that we'd rescued. The first time he got loose, he attacked my 26 year old mare. He didn't bark or growl.. but was like "the terminator" and his goal was to kill her. It took us (both of us!) some minutes before we could catch and stop him. It was, like many of our customers have experienced, a very traumatic experience. Because the Equine Relief Antimicrobial products don't sting, (even though they're as powerful as a surgical scrub), I didn't have to restrain Playmate as I cleaned and treated her wounds every day. Below is the story of the incident. (This is her face with six bites. She had a total of 13 on her body). This is the story of Digger.